In this podcast, I share insights from a doc who barely survived his suicide attempt plus simple ways to prevent the next suicide. Listen in. You may save a life. I’ve never been so happy to fail at something in my life. Four weeks ago today I died. Cardiopulmonary arrest in jail. Why was I in jail? My wife alerted the police. Sheriff deputies were upset when I did not pull over to talk to them after overdosing. After boxing me in, they threw me from my truck into the slushy street and tased me. After charging me with a felony and two misdemeanors, they nearly provided the perfect assist to my suicide. Through a series of miracles, I was brought back. I am missing four days of my life including three on life support, but I am alive. I have to repair almost every relationship I treasure from the betrayal of my weakness, a chore I will perform with as much love and patience as I can muster. I may never practice my specialty again, but I am alive. My family has a husband, father, son, and brother. My wife once asked how we do it in the ER, to be there for everybody’s worst day and also for their best. My worst day was almost my last. Funny thing is I was as happy as I had ever been in my personal life. My decision to end it all was 100 percent work related. I had just lost a young girl in the ER a few weeks before. Influenza. I followed proper protocol, gave her a couple of treatments and she felt better, so I discharged her home with appropriate warnings. Thirty hours later she came back, in respiratory arrest. She ended up on life support with family refusing to withdraw care. They, of course, blamed me. And, of course, complained. My review was days later. While my employers were very sorry about the case and stated support for me, the result would likely lead to termination due to this incident and a few other cases that were trivial. I thanked them for their honesty. At first, my wife and I talked about it, and I was fine. I could likely go back full time where I used to work. I returned to work that night sad, but comfortable with my likely outcome. When I got home in the early morning hours, I was just sad. I cried for the girl and her family. I cried myself to sleep and woke up still sad. 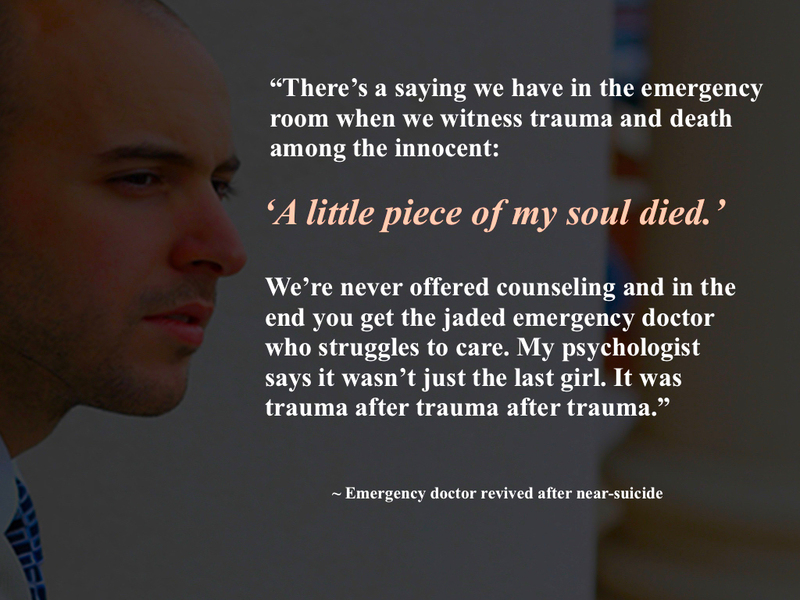 There’s a saying we have in the emergency room when we witness trauma and death among the innocent: “A little piece of my soul died.” We’re never offered counseling, and in the end, you get the jaded emergency doctor who struggles to care. My psychologist says it wasn’t just the last girl. It was trauma after trauma after trauma. 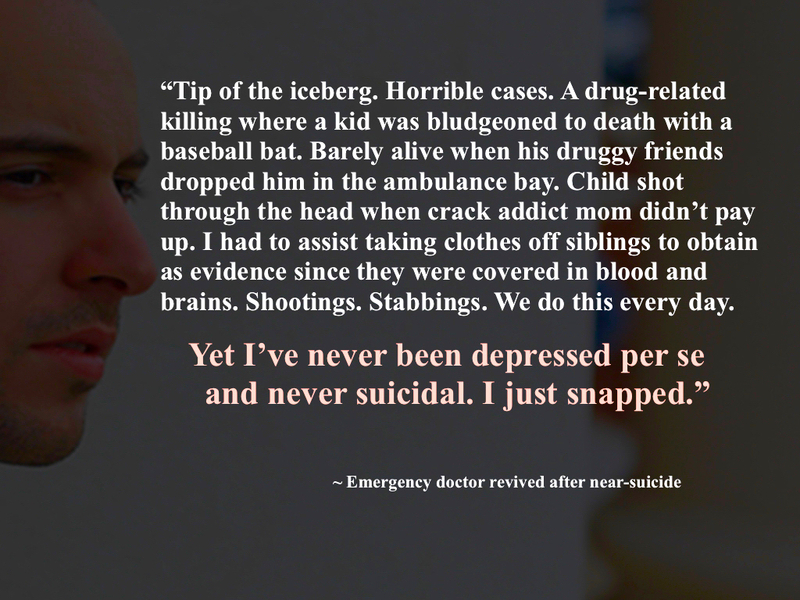 Yet I’ve never been depressed per se and never suicidal. I just snapped. I took a handful of pills with the final thoughts that my student loan debt would not pass on to my wife, and at least she has my life insurance to take care of her. Then came the police cars. I don’t know why, except not wanting to talk to them or face my wife, I continued driving. I obeyed all traffic laws, never exceeded 22 mph and in no way endangered pedestrians or other motorists. At one point I pulled to the side, and multiple officers took cover and aimed guns at me. They wanted to know if I had guns, and I told them that they were in the vehicle and they could have them. I kept my hands visible as directed but refused to exit the truck because I did not want to talk to them. Ultimately, I was thrown from the truck, tasered, cuffed, and put in the back of a police car. Of the next four days, I have almost no memory. I am told I went into respiratory then cardiac arrest in the jail and they started CPR. I was finally transported to the hospital, where they got a pulse back. I was critically ill on ventilator support. My family was told I was going to die. Then my sweet daughter found what I took, and the appropriate meds were given. I improved. Couple days later I was off the vent and out of the ICU. Almost every day, since that worst day, my wife just looks at me and repeats “I can’t believe it even happened!” The people I’ve told about this are utterly shocked. I have spoken with a few residents I used to teach, and they can’t believe it. I can’t either. Could happen to any doctor. Seemingly without warning. Thank you again for all you do to educate and advocate for those that did not make it, and for helping to prevent even more suicides. Of course, you can do anything you want with the story. I don’t want the attention drawn to me specifically, but I hope it can reach someone before it is too late.